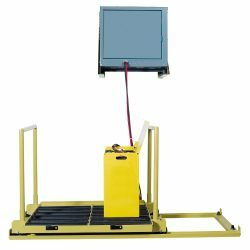 The BHS Traveling Battery Stand (TBS) is a track-mounted, heavy-duty stand with the capacity to hold both a charged and discharged battery during a change-out. The TBS provides a convenient location for charging the discharged battery after removal. The Traveling Battery Stand is available with your choice of two or three compartments of varying widths. All models of the TBS come standard with spark-proof, poly-sleeved rollers that ensure safety, reduce corrosive buildup, and extend product life. The stand’s easy-grip push handles and smooth track-mounted system make battery changes ergonomic and efficient for one person. The TBS works seamlessly with a charger mounted in a BHS Charger Wall Bracket. Combining the TBS with a wall-mounted charger frees up valuable floor space. Adding a BHS Cable Retractor to the mix will further simplify work, extended the life of cables, and prevent tedious tangles from occurring. Make change-outs easy and efficient with a BHS Traveling Battery Stand. Call our sales team at 1.800.BHS.9500 to learn more about our Battery and Charger Stands or to find a local dealer.